An extraordinary movie about an extraordinary man, the highly acclaimed and award winning Chopper is the boldest and grittiest Australian film in decades. Brimming with dangerous excitement and stunning innovation, the sensational debut of rock director Andrew Dominik is an exhilarating sharp shock to the system revealing the no-holds-barred story of the notorious Oz criminal Mark 'Chopper' Read. Told in flashback as Read serves one of his many prisons sentences, this extreme biography charts the brutal carnage and wicked sense of humour of a man who supposedly committed nineteen vicious murders and got away with it. Mixing startling facts from his nine best-selling books, including 'How To Shoot Friends and Influence People,' with stylish pulp fiction to paint an astonishing portrait of a larger-than-life legend, Chopper is funny, fascinating and frightening and features a show-stopping central performance from Eric Bana, Australia's top stand-up comedian. Animated menus. Scene access. Trailer. Animated main cast and crew filmographies. Audio commentary by director Andrew Dominik. Audio commentary by Mark 'Chopper' Read. 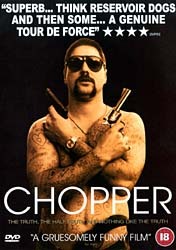 Video interview with Mark 'Chopper' Read. Deleted scenes.